Save the date birthday announcement magnets are perfect for announcing a birthday party and setting the tone for the celebration. If you are looking forward to a typical theme celebration then inform your guests through save the date magnets designed with a theme. 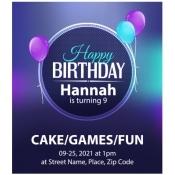 Birthday party invitations are sent a month or two in advance, so are these announcements. Avail free shipping anywhere within the contiguous USA. Birthday celebration is always an event where people love to share their joy of growing old with their loved ones. Birthday parties are usually arranged as a close family affair. Today, with celebrations getting richer, lavish and broad, people are making it a custom to invite their relatives and friends at least couple of months in advance. They know that usually work pressures keep people to forge such events but these magnets will remind them to make necessary arrangements. How do these custom save the date birthday announcement magnets differ from their regular papered counterparts? Customized magnets sticks information over the consciousness and they remain before the eyes at all times whereas the latter usually ends up on table, in the drawer and ultimately in a trash bin. 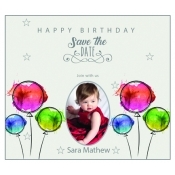 Most people love to retain colorful magnets on their refrigerator doors which mean they are unlikely to take off full color save the date birthday announcement magnets. Also, these typical magnetic save the dates pack bundle of emotions and bear strong personalized impact. People will treasure such colorful and friendly personalized magnets before their eyes at all times. 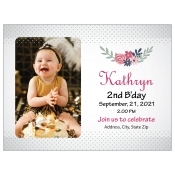 Perfect for sending mailers or as individual gifts during family events or individual celebrations! We offer free art setup, free online design proof and free full color printing. This means investors can go lavish with their choice of colors, visuals and venue information. 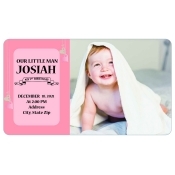 Avail exciting discounts on wholesale orders of these customized save the date birthday invitations. 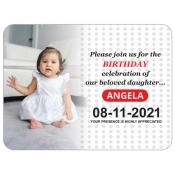 To know more about customization, shipping and other details about save the date magnets, feel free to contact our team by calling at 855-762-4638 or write to us at info@cmagnets.com.